Leftist groups use Bedouin deaths from Hamas rocket fire to push legalizing illegal Bedouin settlements, according to Regavim. Controversy continues over the status of Israel's Bedouin population, after several Israeli Arab MKs protested over an alleged lack of suitable bomb shelters in Bedouin communities in the South. But the issue of Bedouin communities in Israel is more complicated, according to Regavim, a watchdog group for Jewish national property rights, which released a statement last week condemning the work of non-governmental organizations (NGOs) to bring the matter to the Supreme Court. According to Regavim, the claim seeks to legalize the status of thousands of Bedouin community in Israel, using the war as a front. The statement added that "the spurious suit the NGOs brought to the Supreme Court on July 20 completely disregards facts on the ground and the integrity of Israeli law" and that "bringing such a suit at a time of national crisis and sorrow reveals their harmful political intentions against the State and people of Israel." Regavim cites Israeli law as proof, noting that the issue is really a difference between private and public property. "Since the early 1990s, Israeli law requires safe rooms to be built in all new homes and commercial buildings, a responsibility that falls upon home and property owners – not the government," it said. "Citizens who do not abide by government safety codes place themselves at unnecessary risk of injury, fines or eviction." "As a result of ignoring Israeli law, not only have Bedouin settlers not built safe rooms, they have erected thousands of homes in the middle of open expanses of state-owned land in the Northern Negev where knowingly sirens do not reach," it added. "The best way of ensuring the safety of all citizens at all times, whether peace or war, is by equally applying the rule of law to all." 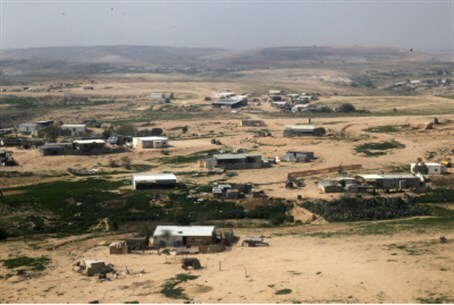 Hundreds of villages and hamlets have been illegally built on state land in the Negev. The unauthorized structures often lack basic infrastructure, including electricity and water. In 2013, the government created a plan aimed at solving the problem. The initiative, dubbed the Prawer Plan, would have seen the state legalize many of the illegal communities, while relocating other communities to more central areas with existing infrastructure. Residents were to have been compensated for the state land they were moved from. The plan was abandoned following major resistance from Negev Bedouin.